Bolivar is a city of about 9,500 people located on Highway 13 between Kansas City and Springfield, Missouri. It is surrounded by recreational lake areas that furnish good fishing and all types of wild game. Bolivar also has an excellent and plentiful work force with the type of people that it takes to make manufacturing and business successful. We of the Bolivar area are proud of our good schools, churches, health care facilties, university, and our strong business and farming community. Fishing, hunting, boating, and camping are all available to Bolivar area residents and visitors just 15 miles away at Lake Pomme de Terre to the north and Stockton Lake to the west. Just 30 miles to the north, Truman Lake also offers unlimited recreational opportunities. A nine-hole and an 18-hole golf course are located west and south of the city. Bolivar has existed as a city since November 10, 1835, when proclaimed as such by the Polk County Court and designated as the county seat. The settlement which was to become Bolivar developed along the trail used by the Overland Stage, hence the reason Bolivar's streets do not run true north and south, instead being offset about 22 degrees to the west. 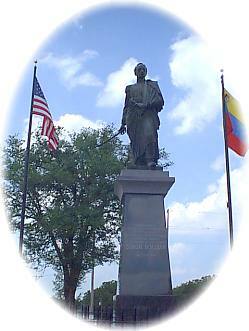 The location of Bolivar as a settlement was also directly related to Keeling Spring now commemorated by a monument. Bolivar was named after a city in Tennessee which initially was named after General Simon Bolivar when news reached the United States of the heroic military feats which were being achieved in South America. Three grandsons of Ezekiel Polk who settled the Tennessee town in 1823, moved to this Missouri area and submitted the names of Polk and Bolivar to the newly formed county and county seat in honor of their grandfather and the town where he was living. Ezekiel Polk distinguished himself as a colonel in George Washington's Revolutionary Army and it seemed fitting that the two names symbolized liberation. Bolivar Country Club is a nine hole golf course, located along Highway 32 West, is open to the public for daily green fees or membership. The Ella Carothers Dunnegan Gallery of Art is the permanent home of the Dunnegan and Wainscott art collections. The wide range of individualistic styles and subjects makes the gallery an ideal place for an "on the spot"
Bolivar living is enhanced by three public parks, Dunnegan Memorial Park is on the north side of Bolivar. It is equipped with pavilions, rest rooms, picnic tables and playground equipment, plus, a small lake populated with ducks, geese, and peacocks.